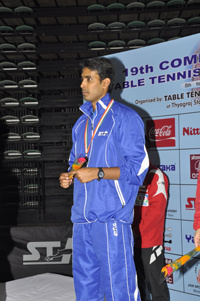 The 19th Commonwealth Table Tennis Championships 2013 was held at Thyagraj Indoor Stadium from 5th to 10th May, 2013. A full contingent Indian Team comprising of 24 Players (12 Men and 12 Women) participated in the above Championships. We are happy to acknowledge that India Won a record number of 9 medals which by far is the best performance by India so far in the Commonwealth Table Tennis Championships. New Delhi, May 10: Indian paddlers came up with their best ever performance, but the chalk and cheese difference became palpable in the 19th edition Commonwealth Table Tennis Championships when the hosts miserably failed to up the ante in six of the eight semifinals they were in on Friday. New Delhi, May 9: The Indian paddlers, nearing the homestretch, assured themselves of six more medals on Thursday to make it the most memorable outing ever in a Commonwealth Table Tennis Championships at the Thyagraj Stadium here. The mixed doubles pair of Soumyajit Ghosh and Mouma Das added a silver on Thursday to the two-silver (men) and bronze (women)-already won in team events and added a bronze today in the mixed doubles where. New Delhi, May 9: The Indian paddlers, nearing the homestretch, assured themselves of six more medals in the ongoing 19th edition Commonwealth Table Tennis Championships at the Thyagraj Stadium here today. They had earlier won silver (men) and bronze (women) medals in team events. New Delhi, May 8: Singapore, deservedly, retained the men and women team titles in the 19th edition of the Commonwealth Table Tennis Championships at the Thyagraj Stadium here today. Their women paddlers first downed England 3-0 and their men followed it up with a perfect decimation of India for a similar score, taking a little over 90 minutes in all.